As a lifelong fan of scary movies, creating something in the realm of a movie poster sounded fun to try. That is how this little experimental project began. Originally, I had thoughts of doing a scary doll photoshoot, with a cemetery being only 1 of the many location ideas. That is until I randomly came across this scale model church made of stone. Instantly, I knew that this had to be my environment for this shoot. Next up, was to find a scary doll or something similar. Searching Amazon, I discovered this possessed nun doll. Perfect, with a church… why of course it would be appropriate to use a possessed nun doll. I had only checked out this church one time before the actual shoot. Additionally, I have never photographed a doll before; well not in the manner of trying to make it look relatively realistic. Arriving onsite for the actual photoshoot, I was optimistic, yet a little nervously excited for my results. I have zero interest in vandalism, nor do I have any interest on intruding on graves. This exact spot was not immediately next to any graves. From my initial scouting of the spot; I knew that the scale model church already had 1 of the 6 windows missing. With this missing window, I could place a red-gelled light, inside of the church, to give the church windows a red glow from inside. Everyone loves a church that is glowing red from inside of it, right? Window was already missing, but this allowed me to put a red light inside of church. So, I’m onsite, I’ve parked my car off and out of the way. Then I’ve hiked all my gear over to the little church. It is 1.5 hours before sunset when I arrive. Initially I begin playing around with the placement of the doll; in composition to the camera & in orientation to the church. Finalizing the placement of everything in relation to the church, to get the correct impression of size of the doll in front of the church. Composition of possessed nun doll in front of church, within a cemetery. Used off-camera-flash to light the nun doll at sunset, while keeping cemetery dark and moody. My intention was to respect the cemetery’s rule of no visitors after dark (well just barely), but I still was wondering if anyone would see me; in particular with a possessed nun doll, they might not appreciate my art as I do. So at this point, I’ve spent some time getting everything dialed in; the doll composition, the camera placement and my camera settings. All along, the intention is to use off-camera-flash to light the doll, yet keeping the environment exposed for more of a dark & moody vibe. I’ve been watching the sunset over my shoulder while I’m adjusting everything. 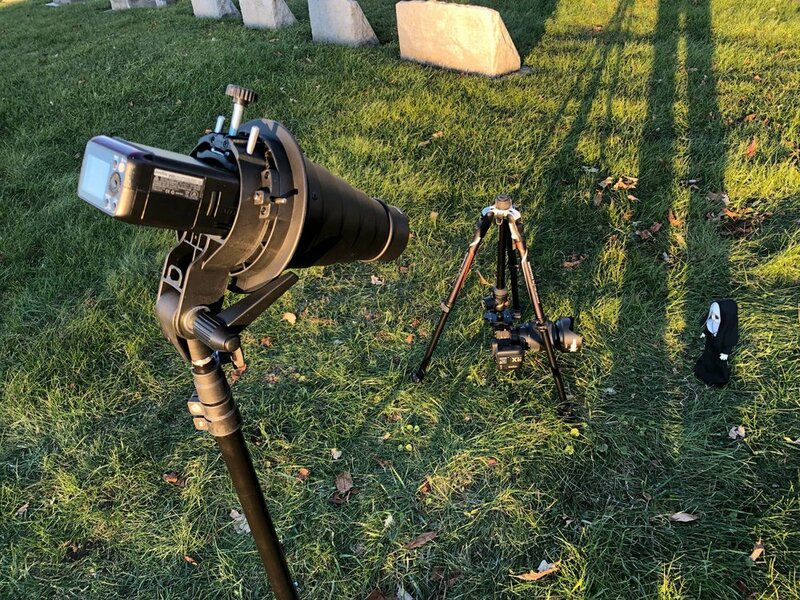 As the sun is almost to touch the horizon and darkness is approaching, I make my final camera & flash setting adjustments to maintain the exposure of both the doll & the environment as I want them. This is the moment, the sun has begun to go below the horizon and the light is dim, but golden. I start snapping my shots. Capturing numerous in various zoom distances (focal lengths). Really, with my test shots that I had done, these shots that mattered, are drama free. Afterwards, I scramble and struggle to pack up my gear with fingers that hurt from the cold and get out of there without being seen. 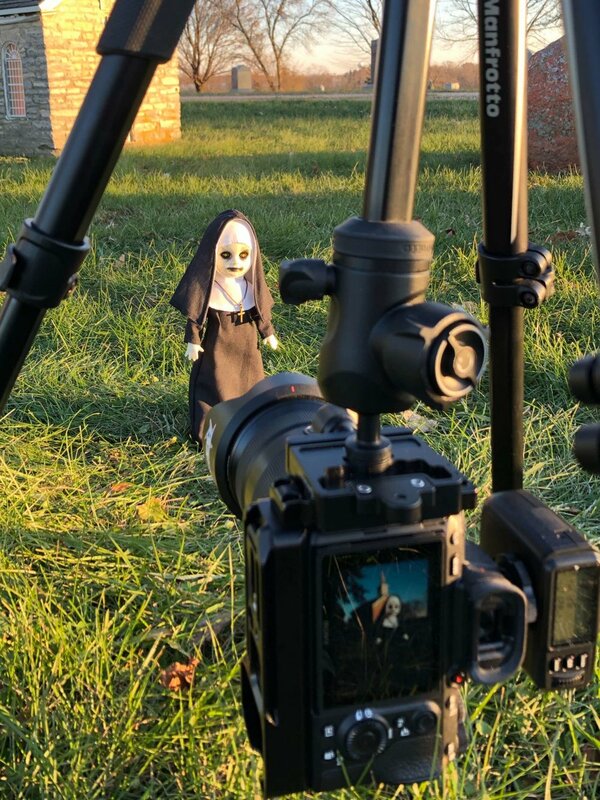 It looks like my camera screen is all cracked while shooting the nun doll, but it really isn’t. Adding to the moment, the batteries of the light that I placed inside of the church, they kept going dead within about 15 minutes. This light is rated to last 1.5 hours of continuous use with the 6 AA-batteries. I hadn’t brought many extra batteries, as I knew that I would be there for only about 1.5 hours in total. But yes, this added to my nervousness of the shoot… as the church with the red glow from within was a key element to my entire vision. Additionally, with the camera being barely off the ground and it also nearly 30-degrees outside; I was using my iPhone connected to my camera via WiFi. This allowed me to compose my shots on the phone & also use the phone as a remote trigger to fire the shots, without laying on the ground. But just like the light inside of the church, my iPhone’s battery quickly drained at an alarming rate… with my phone actually abruptly turning completely off before it was even fully drained of battery. As I previously stated, I do enjoy scary movies & even allowing myself to even get a little spooked in the night. So it should come as no surprise that I have watched numerous ghost hunting documentaries. One thing that I’ve seen numerous times in them, is when batteries die abruptly; supposedly from the ghosts & spirits using the battery’s energy. Well the thought did cross my mind, in the moment. But anyway. This was a fun shoot for me to try. I’m fairly happy with the results, but of course would like to try again & take it a step further for better results. But that’s part of the fun of photography; the learning, the experimenting and just getting out in different and unique locations. Plus, this still can be some experience for portrait photos as well.